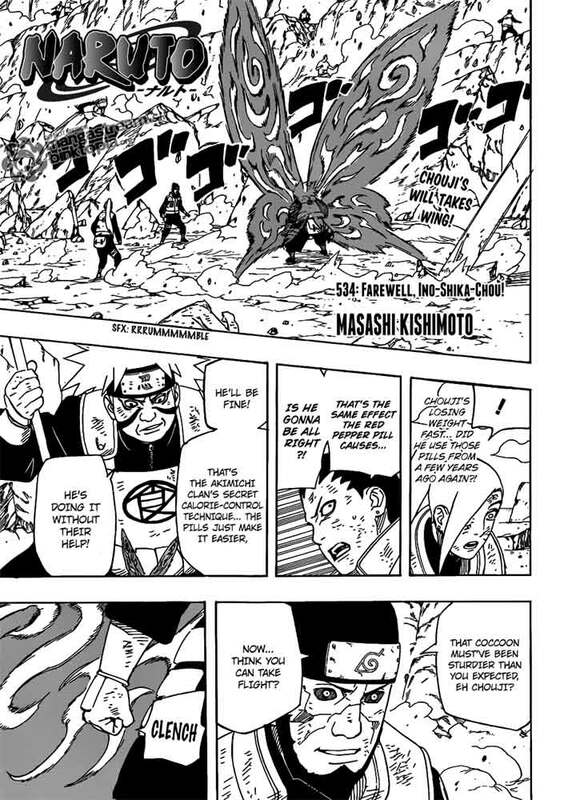 Naruto Manga Chapter 534 Farewell, Ino-Shika-Chou! Finally Chouji decided to release his secret technique without the red pepper pill. He is able to do it because of the will to surpass his teacher Asuma. 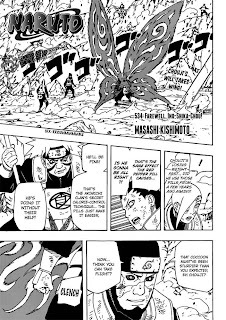 Now the three of them have to created a chance for sealing squad to completely sealed Asuma off. Shikamaru use shadow sewing technique to control white Zetsu and attack Asuma, and when Asuma's defense become weak, Chouji hit him with confidence face. While Asuma stuck up on the wall, Shikamaru use shadow mimic shuriken technique to make Asuma can't move. And before sealing squad doing their job, Asuma say a farewell word to his beloved student. He proudly say that Ino-Shika-Chou formation was perfect. After their battle over, Chouji became more adult and take initiative to ending the battle in there. And finally after some episode, Naruto shown up, he can't concentrate in training after sensed something's up out there. Naruto's trying to leave the temple but Tsunade give order to freeze Naruto. And when Naruto ask them the reason he can't leave that place, Iruka sensei appear in front of him.